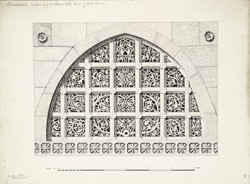 Illustration of window located left of the entrance from Shah Alam's Tomb at Ahmadabad in Gujarat. Shah Alam's tomb was built in 1485 by Taj Khan Nariali, a noble in the court of Sultan Mahmud Begarda (r.1459-1511). The tomb, or dargah, is one of a complex of buildings, including a mosque and the Jamaat Khana, or Audience Hall, situated two miles outside the city. Shah Alam was the son of the Muslim saint Qutb-ul Alam who is buried at Batura, a further four miles south of the city. Shah Alam's tomb stands on a low platform with three concentric pillared halls; the outer hall is enclosed by stone trellis work. The inner enclosure is covered in a dome supported by 12 pillars, with the tomb itself in the centre. There is an entrance on each of the four sides, but the main entrance is a porch with coupled pillars on the west side.